Assumption High School works diligently to meet the needs of our many families seeking financial assistance. Thanks to our generous donors and Assumption community, approximately $1.2 million was awarded in financial assistance for the 2018-2019 school year. In an effort to assess all applications, the school works with an independent organization, FACTS Grant and Aid Assessment which reviews applications and supporting information to make a need based determination. Financial assistance at Assumption comes from a variety of sources including our annual Fund for Assumption, Rocket Spectacular Benefit Dinner & Auction, and the Walk for Assumption. Families receiving financial assistance are expected to assist with Rocket Spectacular. We are grateful for the generosity of our many donors who truly value the mission of AHS and assist us in making an Assumption education possible for your daughter. Students must be registered at Assumption and have paid the registration fee in order for a financial assistance application to be considered. The online application and a fee of $25 must be submitted to FACTS by February 28, 2019. Financial Assistance funds are limited. Late applications are held and will only be considered after all applications filed on time (February 28, 2019) have received awards. Please include your 2017 federal income tax return and W-2 forms with the application. A student’s financial assistance may be forfeited if they do not maintain academic and behavioral expectations. Letters of determination are mailed to families in May. Please email Tammy Finch, Accounting and Human Resources Manager, or call 502-271-2513 if you have questions. Please see SCHOLARSHIPS for additional financial assistance. OPTION 1 – Single payment due July 1, 2019. Payment is made directly to Assumption High School. A single payment made by July 1, 2019, is $13,700. A 1% late fee will be assessed on balances not paid by the due date. A statement will be mailed prior to the due date. An additional 3% processing fee will be charged if payment is made by credit card. Seniors will be charged an additional $175 Graduation fee. Sophomores will be charged an additional $75 ACTS fee. The additional charge will be reflected on your statement due July 1, 2019. OPTION 2 – *Four equal payments due in July, October, January, and April. Payments made through FACTS only.Four equal tuition payments of $3,462.50 each for a total of $13,850. Payments can be made on either the 5th or 20th of the month. Seniors will be charged an additional $175 Graduation fee. Sophomores will be charged an additional $75 ACTS fee. The fee will be added to your FACTS account and divided over four equal payments. OPTION 3 – *10-MONTH PLAN – Payments made through FACTS only. Payments are due July 2019 through April 2020 and can be made on either the 5th or 20th of the month. Monthly payments are $1,400 for a total of $14,000. Seniors will be charged an additional $175 Graduation fee. Sophomores will be charged an additional $75 ACTS fee. The fee will be added to your FACTS account and divided over ten equal payments. * Payments through FACTS are made by automatic bank payments from your designated bank account. If you selected Option 2 or 3, you will be sent instructions for setting up your online FACTS agreement. This online process must be completed by May 1, 2019. 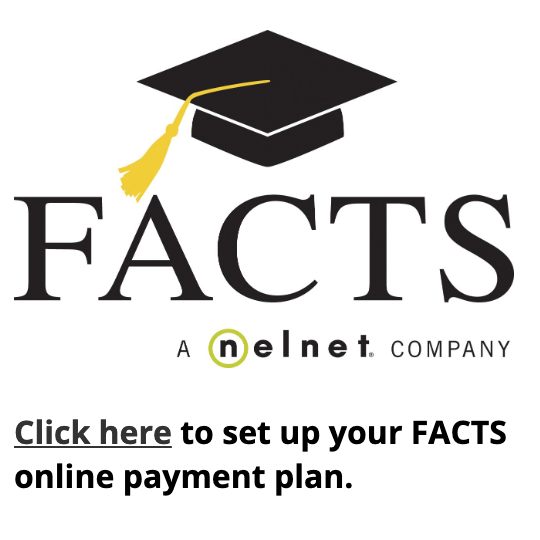 FACTS charges a non-refundable annual enrollment fee of $45 per agreement. FACTS offers optional Peace of Mind insurance for an additional minimal charge ($20/year).If you have applied for financial assistance thru FACTS Grant & Aid and financial aid is awarded, the school’s finance office will make the necessary adjustments to your payment amounts. You will be sent notification of the adjusted payment amount. This process is expected to be completed in early May, 2019. PLEASE NOTE: All methods of payment must be current for your daughter to begin the 2019-2020 school year. Please see below information related to the K-12 tax law changes for 529 savings accounts and KY HB 434 that was passed this year with an enactment date of July 16, 2018 in Kentucky. The tax plan signed into law on December 22, 2017 by President Trump includes provisions related to 529 college savings plans. Effective January 1, 2018, qualified withdrawals for federal tax purposes have been expanded to include up to $10,000 in tuition per student in connection with enrollment or attendance at public, private, or religious elementary or secondary schools. Only the federal tax treatment for qualified distributions was changed by the federal tax plan. At this time, states are reviewing the impact of the federal tax change to determine whether they require changes to state legislation. Additional updates pertaining to the state tax treatment for K-12 withdrawals are forthcoming. We recommend you consult a qualified tax advisor about your own personal situation.